A bipartisan bill that would permanently prohibit horse slaughter in the US and prevent equines being exported to abattoirs across the border has been announced by four senators. The Safeguard American Food Exports (SAFE) Act was announced on Friday by US Senators Bob Menendez (D-N.J.), Lindsey Graham (R-S.C.), Sheldon Whitehouse (D-R.I.), and Susan Collins (R-Maine). While its key aim is to forbid slaughter on American soil, it would also ban any related interstate or foreign commercial activity, such as the export of horse meat or the transport of live horses to slaughterhouses in other countries. “The gruesome practice of slaughtering horses for food has no place in the United States, and it’s well past time for Congress to say once and for all that horse meat is not what’s for dinner,” said Menendez, an eight-time recipient of the Humane Society’s Humane Champion award. “Horses are routinely treated with drugs that are not fit for human consumption and do not belong in our nation’s food supply. 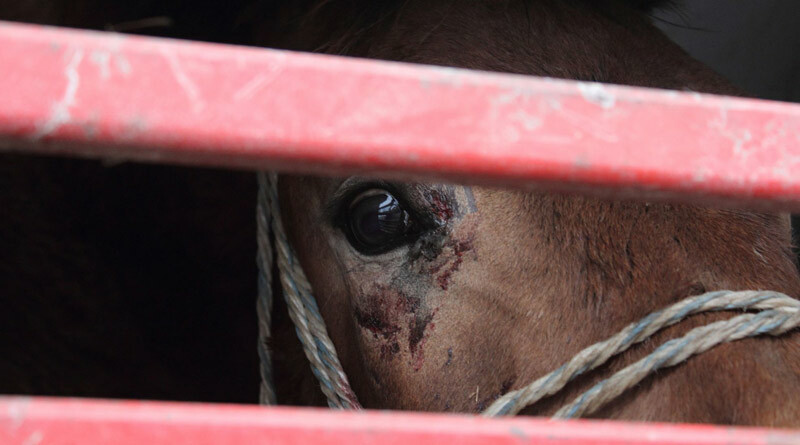 While slaughtering of horses for human consumption in the US is rare, figures from the National Agricultural Statistics Service at the US Department of Agriculture reveal that more than 100,000 American horses are exported to Canadian and Mexican slaughterhouses each year. Earlier this year, Menendez led a bipartisan coalition calling on Senate appropriators to defund horse slaughtering plant inspections by the US Department of Agriculture, which effectively prohibits any slaughter plants from killing horses without imposing a direct ban. The senior vice-president of ASPCA Government Relations, Nancy Perry, said horse slaughter was inherently cruel and posed serious threats to the safety and wellbeing of American horses and consumers. The president and chief executive of the Humane Society of the United States, Wayne Pacelle, said: “Americans don’t round up dogs and cats for slaughter and ship the parts of the animals to foreign countries. We shouldn’t do that with horses either. Pacelle has long been critical of the slaughter trade, arguing that was inherently inhumane to force horses to endure long journeys to slaughter plants without adequate food, water or rest. He has labelled horse slaughter a predatory enterprise, saying buyers acquired young, healthy horses, often by misrepresenting their intentions, and inhumanely kill them to sell the meat to Europe and Japan. Companion legislation was filed in the House earlier this year by US Representatives Vern Buchanan (R-Fla.), Jan Schakowsky (D-Ill.), Earl Blumenauer (D-Ore), Ed Royce (R-Calif.) and Michelle Lujan Grisham (D-N.M.). The full text of the bill can be downloaded here. This is insane; Horses are highly emotional Animals & don’t deserve to be treated in such an inhuman way! It’s barbaric! Not to mention the chemicals that are used for vaccinations are not for human consumption!! Stop the madness; We’re meant to be vegetarians; look at homosapien history! Wakeup!! “This bill should pass, and is proper. However, it will not relieve the Sec. of the Interior, Mr. Ryan Zinke of his budget crises related to the BLM and the costs of housing wild horses in corrals at the rate of $50-m/yr. This bill may simply force a mass euthanizing of corralled wild horses and burros. We must not allow that to happen either! The key to success is providing Sec. Zinke with a logical alternative path (that doesn’t create a conflict of interest which can stonewall any progress) for handling the wild horses in the pens. Just telling him ‘no’ is not a solution! America (and other places in the world) are suffering from ‘Megafire’, as it is termed by Dr. Paul Hessburg. The rate of deforestation due to these intense fires, which kills all the trees (including heat resistant conifers that need normal fire cycles to release seed), is alarming! In 2015 the west coast of North America lost 10.1-Million acres of forest, killing millions of animals (including rare and endangered species) and than means those related watersheds are severely damaged, which affects fisheries and available water for mankind. The catastrophic destruction from just that one year (and that trend is continuing as we are in a warming climate cycle) is incalculable! Among other scientists who support the Wild Horse Fire Brigade concept, I have spoken with Dr. Hessburg, who is a USFS expert and researcher in the field of fire-attack and pre-fire management strategies – landscapes. He sees a place for wild horses as a part of an integrated pre-fire management strategy (especially in fragile ecosystems that are not well-suited to mechanized management) in the creation and maintenance of fire-breaks, fire-anchors and containment areas in and around forests via their natural grazing and mutualism with meadows and trees. The bonus is that unlike cattle or cervids (deer, elk moose), horses are immune to the emerging prion-based Chronic Wasting Disease (CWD), which is thought to be transmitted into cervids via grasses and brush. Dr. Mark Zabel, the Assistant Director of the Prion Research Center, has written to me stating that it is a “very bad idea” to graze cattle or sheep in areas where CWD may be endemic. This because these infectious prions (misshapen proteins) could potentially manifest in cattle as Mad-Cow disease and Scrapies in sheep. We live in an insane world with so many issues facing the American people, however I am speechless that we are still debating this issue. Once and for all we need to protect this majestic animal that has been an integral part of our American history. We pass laws to protect dogs and cats (and rightfully so), we need the same to protect our horses. Be their voice. Now release the wild horses and burros in the corrals of the BLM. Why are they wasting away there. Why were they even rounded up? Was the BLM hoping to use them for slaughter to handle their deficit? This must be stopped. Nature know what the land can handle and will only allow that many horses or bison to graze in that area. It is man who tries to push everything over the limit. I want the horses and burros released. Horses are the creators of our history! They say the west was written from the back of a horse! They were our means of transportation as well as others best friends and companions! They are emotional and more sensitive than most animals on earth and shouldn’t be sent to slaughter!! I truly believe this bill should be passed that slaughter shouldn’t be an option and people that choose to over breed and throw away or abuse their horses should be the ones held responsible!! Why make the horse pay the ultimate price? They are innocent in this matter…they are a victim of bad humans! !